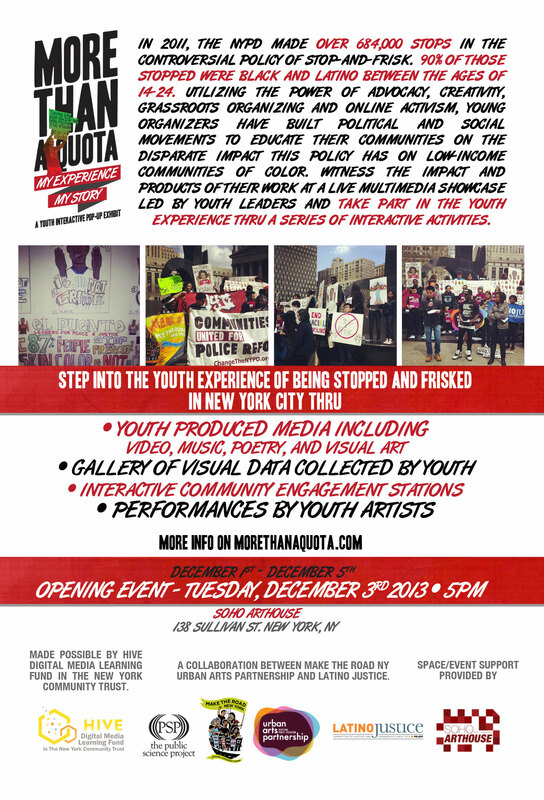 Youth leaders from The Academy at Urban Arts Partnership, LatinoJustice PRLDEF, and Make the Road New York in partnership with Public Science Project invite all the member organizations of Communities United for Police Reform to: “More Than A Quota: Our Experience, Our Story,” a multimedia digital pop up exhibit at SOHO ARTHOUSE, 138 Sullivan Street, New York, NY 10012, to showcase creative responses to the experience of being stopped and frisked as a NYC youth. This digital showcase provides a venue for NYC youth to create original media and share multimedia projects that give students a voice in the discourse around community policing. Youth have become producers of original media and have designed a social media campaign to capture and tell their stories. The HIVE NYC Learning Network, the MacArthur Foundation’s Digital Media and Learning initiative, supported this collaboration between cultural organizations to create new learning pathways and innovative education practices.